Buildings trembled when the September 1997 earthquake hit central Italy, including the ancient town of Cagli in the Marche region. Cagli was not hit as hard as other towns in the region — the dome of the duomo, the basilica cathedral of the city, was slightly pulled away from a support wall — yet the city still received a large amount of money from the government to repair damaged buildings. Some sources said the restoration the church needed was simply a way to receive free aid and repair other parts of the town. Damage to the basilica cathedral, built in 1424, was the main reason Cagli received money; but the small city of 10,000 received much more aid than that restoration required. "The state gave money, and Cagli took advantage of this by restoring other things,” said Nazzareno Bartolucci, the priest at the cathedral. Private homes as well as part of an elementary school and other public buildings also received minor damage — not nearly as much as the duomo — and they also received government money. "Before the earthquake hit, there was shaking going on for about a year..."
The bell tower was heavily damaged by the earthquake. In all, Cagli was given more than €15 million to make repairs, but Cagli only ended up using €11 million. Of the €11 million, about €4 million were used for the church and other public buildings. "Each building had its own problem, and the state gave money to repair those buildings,” said Domenico Papi, the mayor of Cagli. 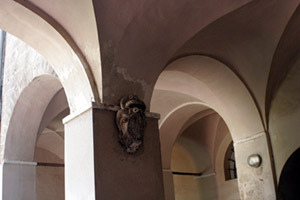 Cagli has a lot of historical buildings and other architectural features. It was under control of the Roman Empire in 295 B.C. and then fell to the Goths and later to the Byzantines, who included it in the Mediterranean Pentapoli. The Via Flaminia, one of the Rome’s earliest roads, is nearly 5,000 years old. In 1287, a fire destroyed most of the city, but two years later Pope Nicholas IV rebuilt it. Much of the earlier architecture of Cagli was destroyed in this fire. Many of the structures erected after the blaze remain functional today — including City Hall, which was built in 1289, and La Fortezza, the walls around the city of Cagli, built in 1463. In 15th century the Montefeltro family of Urbino controlled Cagli. 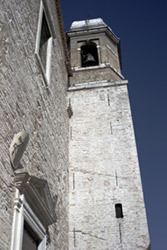 Then from 1502 to 1503 Cesare Borgia, who built the grand tower, the city’s landmark structure in 1502, governed the city. The Medici of Florence ruled Cagli from 1513 to 1521. In 1631 it was taken over by the Papal States, and it remained this way until the unification of Italy in 1860. Not only is the architecture of Cagli ancient and historically significant, but the artwork is significant as well. Frescoes — some of which are located in the cathedral — date back to the 13th and 14th centuries during the Roman-Gothic era. 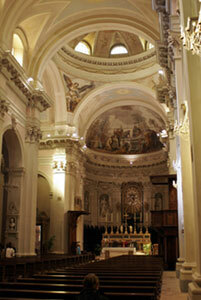 Renowned artist Maestro di Monte Martello painted the walls of the sanctuary of Santa Maria delle Stelle. Cagliese churches also contain the work of Giovanni Santi, father of the Renaissance artist Raphael. "Thanks to the money given by the office of the region, the paintings were restored to their natural richness, and we are able to see and enjoy them,” said Papi. After the earthquake, frescoes by the late Gothic painter Mello da Gubbio were discovered in the vault of the church of San Francesco. Whitewashing had covered them in the 18th century. The frescos contained nine lunettes and crowns of the 13th century Gothic vault and portraits of the 12 apostles with angels and prophets. Once the frescoes were discovered and recognized as the work of Mello da Gubbio, the office of the region was contacted, and money was granted to restore the paintings. The duomo has many frescoes that were restored after the earthquake. The duomo had also been damaged in an earthquake in 1781. The dome near the main entrance was attached to the wall, and this collapsed as a result of the first earthquake and remained unstable as a result. During the 1781 earthquake, Bartolucci explained, 74 people were killed. They were buried underneath the church, and every year the people of Cagli celebrate and honor those who died. The town was extremely upset by the tragedy, but the ceremony of remembrance continues to be a way they can come together to remember what happened. After the 1997 earthquake, the dome again separated from the wall, but it did not fall and there were no visible signs of damage. Cagli was lucky compared to other towns during the most recent major earthquake. Assisi, about 53 kilometers from Cagli, had the most impact. At least 10 people were killed, and many buildings and pieces of artwork were damaged. The Basilica of St. Francis of Assisi is located at the birthplace of St. Francis, making it an important landmark for Christians. The first part of the earthquake appeared at 2:35 a.m., and when the second part of it hit several hours later, four people who were looking at the damage from the first shocks were killed. Some pieces of art were also damaged including one work associated with the school of Giotto. In Cagli, the duomo remained closed for renovations for seven years, forcing long-time parishoners to attend services at other churches. Although they were frustrated by the fact that they could not attend their church, the community was grateful that no one was hurt. "I was very upset, but everyone thanked God that everyone was okay,” said Bartolucci. On Palm Sunday 2004, the doors of the basilica cathedral opened once again to greet the smiling faces of the Cagliese people. "It was easy to see that Cagli had its church back again,” said Bartolucci. Construction projects in Cagli may restore damage caused by the earthquake. The earthquake caused visible damage to many buildings in Cagli.